DESIGNED TO MAINTAIN SKIN MICROBIAL BALANCE. DOUXO® Pyo is antibacterial and antifungal. It externally cleanses the skin and maintains skin microbial balance while protecting the skin barrier. It soothes and hydrates. 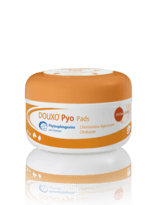 DOUXO® Pyo contains antiseptic and Phytosphingosine. DOUXO® Pyo is designed for the antiseptic cleansing of the skin of dogs and cats but it does much more than act as just an antibacterial. The pro-ceramide Phytosphingosine and the soothing and moisturizing agents help restore and strengthen the mechanical skin barrier, and soothe irritated skin. To enhance their action, our formulation specialists have designed an acid pH for our DOUXO® Pyo products. The healthy canine skin has a pH usually between 5,5 to 7,2.  An acidic pH of the skin surface helps to maintain the integrity and cohesiveness of the skin barrier and to control the balance of skin microflora. Pads are great to care for small and difficult to reach areas. Impregnated cotton pads. Ideal for small, difficult to reach areas. Helps maintain dermal microflora balance and skin barrier functions.